Hey, hey, hey, Groove-ophiles! Can ya believe it? Today is six years since Ol' Groove started blabbin' on this here blog! Six years of cool comics, terrific trivia, and rancid ramblings, all made possible by you! Yeah, I'm blamin' you, Groove-ophiles! If it weren't for your enthusiasm and support, Yers Trooly would'a quit this bloggy thing (apologies to Tony Isabella) bleems ago! But no! You keep encouraging me, so I keep on truckin'! Really, all kiddin' aside, Ol' Groove humbly thanks ya from the bottom of his tie-dyed heart! 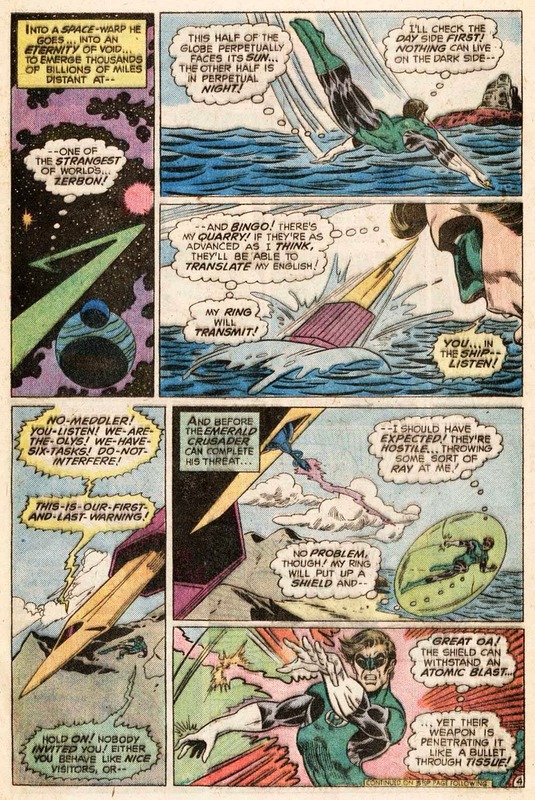 Since the Diversions started with a Mike Grell-centric post, Ol' Groove thought it only fitting that we celebrate the occasion with a Mike Grell-illoed masterpiece. Whaddya think? This particularly superb sci-fi short, "Let There Be...Darkness! 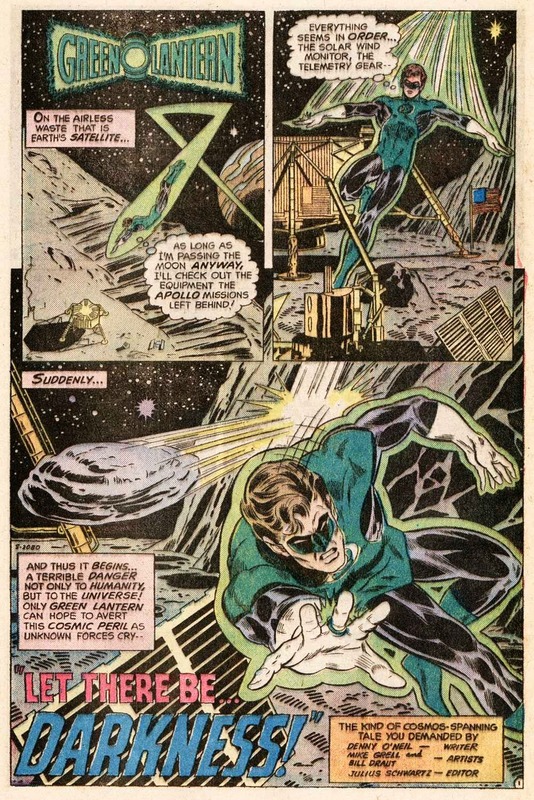 ", was written by Denny O'Neil and inked by Bill Draut. 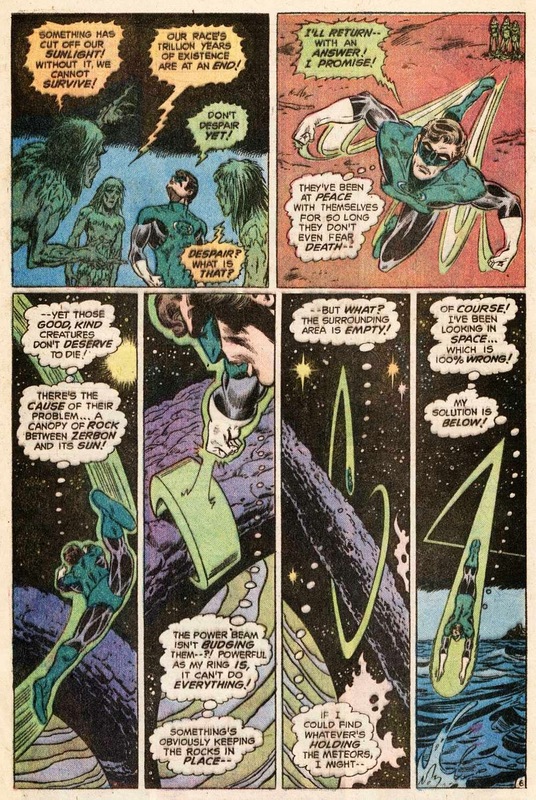 It first appeared in the back of The Flash #237 (August 1975), during the time when O'Neil and Grell were working toward bringing Green Lantern back to greatness (and back into his own title). Their cosmic style clicked with both fandom and editorial, so about a year after this tale was published, GL would, indeed, get his own mag back under Denny and Iron Mike. Don't ya love happy endings? Congratulations on the big 6 year mark, Groove! Here's to 6 - ah, hell with that - 60 more! 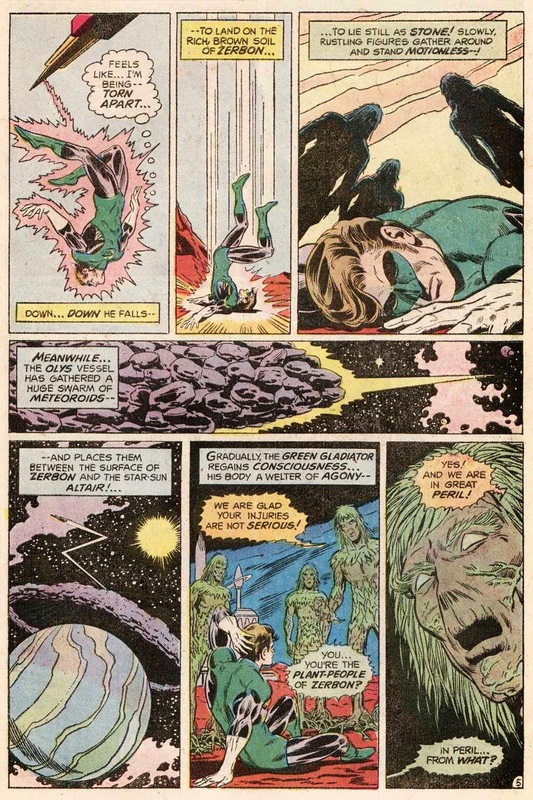 Otherwise, I've never seen this story, but the first GL stories I read were from the revived series, picked up randomly off of the racks in '76 and '77 - and I recall that Grell was doing to the art. Thanks, Edo! I can always count on you to stop by and comment--Ol' Groove sure does appreciate ya! 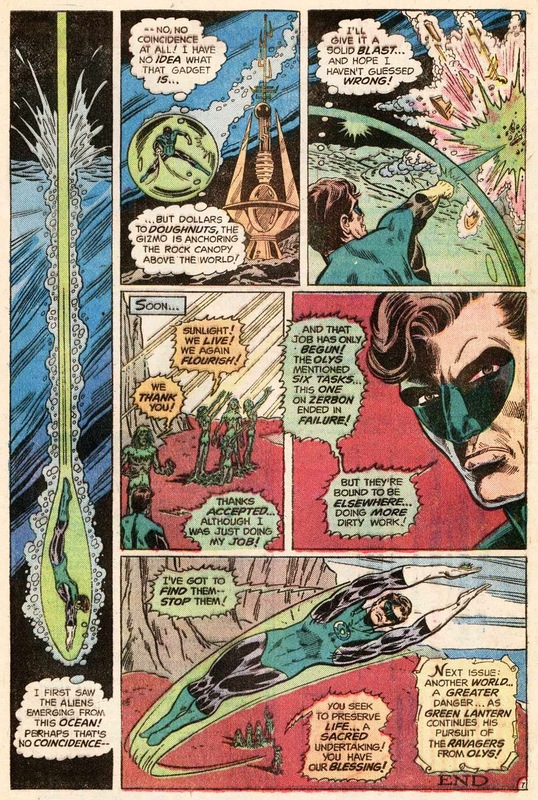 And you're right on--Grell was pretty much the regular revived GL/GA artist through much of 1978! Thank YOU,Mr Groove,for all the wonderful posts over the years. Holy Moley! It's been 6 years already! WOW! Congrads! I think I discovered your site 9 months or a year after you started it. Congrads! Here's to many more! I just heard from writer Elliot S.Maggin on Face Book this morning. Along with author Charles Sailor who wrote the Second Son (1979).As we'll as Marvel artist Keith Pollard. Keith is going to ink Man-God part II. 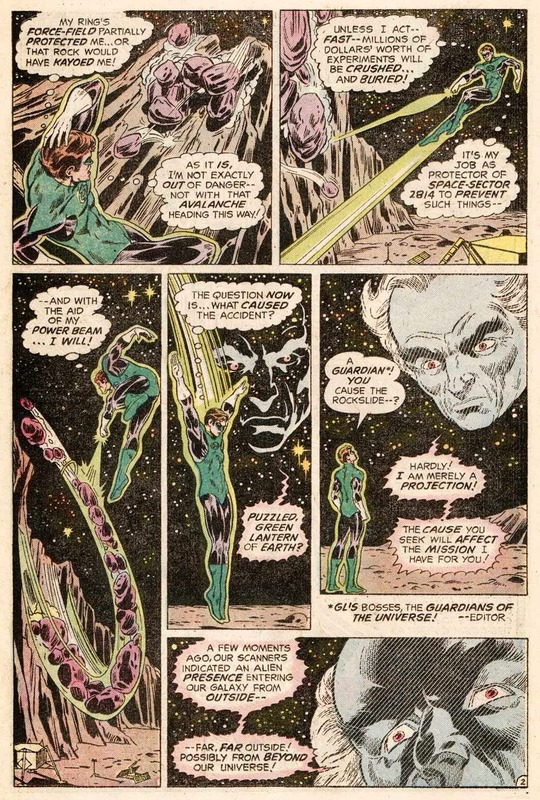 Over Rich Buckler's pencils. How cool is that! Congrats, Mike! Keep us posted on Man-God's progress! Congrats on the longevity milestone Groove. 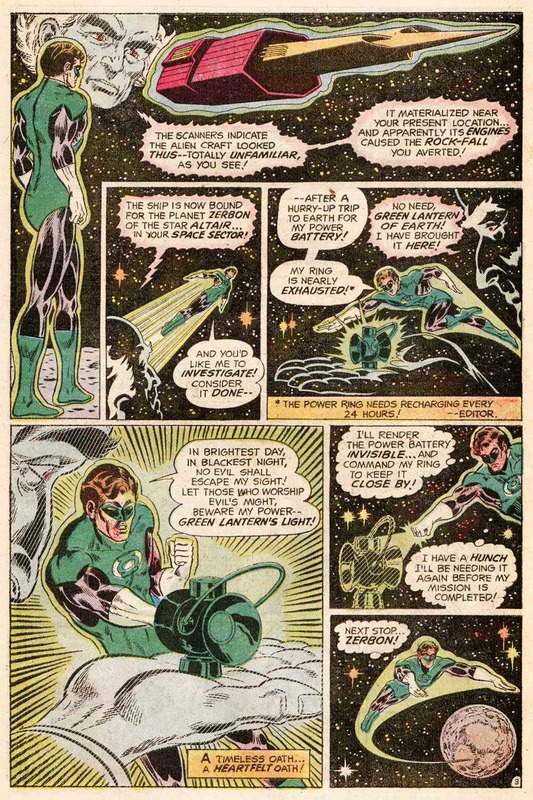 I remember reading this GL story as a kid but have no idea what the Flash story in front of it was about. I totally dig these weird inking match-ups with these dudes from the 40s like Draut, Kida, Kweskin, McWilliams, etc... ONLY in the Groovy Age, baby! Your blog brings back lots of memories and more than a few things I missed out on the first time.